I like this too, with the Fiero emblem in the middle, words on top and bottom. Oh my... its the MAP sensor cover box .... not the plenum.. I have plans for "Tyler's Toy" on the car somewhere.. Be patient. On the plenum note.. Since we will have the intake off, would it be wise for me to call Rodney and purchase a set of the steel vacuum lines for the car? I worry that the existing lines will break. We can always repair them using short lengths of rubber hose. If I do come out I call dibs on swapping intakes. I don't know why but for some strange reason I like swapping them. They are going into the powder coater today. Also what would be cool is a timelasp video of the car in the shop. Barbie from the Frazee Forum news mentioned that she would have a camera/camcorder there so we could easily do photos and time lapse. I am sure everyone has been anxiously awaiting an update. Our first day home went really well. First the ride home was good. We had a few bumps to start out, but the ride was pain free and smooth sailing. The welcome in Frazee was amazing to say the least and made me cry. Tyler is so fortunate to have such amazing support from our whole town. Once we got him in the house, his hospital bed was already set up. The hospice nurse met us at the door and the intake for that was quick and slick. I already know that this is an amazing program and am very glad they are going to be part of the next step in this journey. Carter and Cassie didn't make it home until today. We thought maybe Cassie was a little under the weather, so we held off until today. To say this was hard on them and me is an understatement. I have been really missing my litte kiddos and so were Jay and Tyler. Today they came home and we let them miss school. It was just nice to have everyone at home under the same roof. We only had a few visitors today, but Tyler had a really good feeling day today. We got him up in the recliner and he was there for about 3 hours or so and no problems or pain. Tomorrow Jay is maybe going to be working on a wheelchair ramp with a friend of his and maybe we can kick Tyler out of the house for a little bit every now and then. Tyler has been eating all day, a little here and there. Ice cream, sherbet, a little hot dish, coco wheats. It is kind of like this guessing game of let's try this and see how it goes. Sometimes he likes it, sometimes he doesn't, but he has been eating with no nausea and drinking a little all the time all day long. On a more serious note, now that we are home I am kind of at a loss of what to do with myself. It seems like we have been waiting for this coming home moment for so long that now that we are here I am a little lost. I am just not sure what to do... does that make sense? Today we kind of sat around and looked at each other. How does a person know what is the right thing to do? Do I work? Do I get out of the house and see friends? Do I get back to what used to be our normal routine? I am just feeling very uncertain. I like a plan... a goal... a direction. I guess now that we are home I need to find that again. It was actually hard to leave all of the wonderful staff at Meritcare. We will miss them very much as they became very special and dear to us. A part of me didn't want to leave. It was almost like leaving the hospital made all of this real, like if we stayed in the hospital we would just continue "waiting" and nothing would ever change. Leaving the hospital for me was sort of like a line we crossed into the next stage of cancer. This probably makes absolutely no sense to anyone but me... by now everyone knows I have these moments. I know God is with us every step of the way, but sometimes I feel like I need to reach so far to find Him. Tyler is very excited about his car being fixed up too. I can't tell you how many times he mentioned it today. That people he has never even met face to face are coming here to do such an amazing thing for him is beyond amazing. You have given him something to look forward to, a goal, a direction. He is GLOWING folks when he talks about this! I was thinking that as well.. Having a central website for everyone, with a few pages. 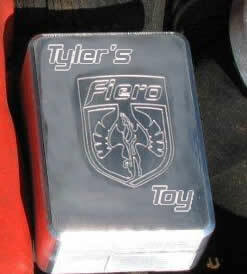 An "About" for Tyler, a page with facts about the Fiero, a page about PFF and what we are doing... You get the idea. That post right there make it worth the work! Its truly humbling to know that people in this world still have a heart. What do you think of the hats? I say go for tylersdream.com as it is his dream and it does not sound like a P O R N site. I say go for tylersdream.com as it is his dream and it does not sound like a **** site. Either way... I still prefer toy. I am all in on that idea. Again, don't have much in the way of funds, and can't contribute from the car fund. I'll help however I can. hey guys this is so amazing it seems like all i do is sit and talk about what you guys are doing to my fiero. you guys are incredible and i cant believe how much support there is from all of you guys. I cant wait to meet everybody and i just want to say thanks to everyone this is awesome. Hey man, it is great to hear from you. I am glad you could join us. Now, we fully expect you to get off your backside and put some work into this with us..
Marker lamps for all four corners. I see that the rear passenger does not fit right in one of the high res photos I was sent... They may not be used at all, and you would get them back, but for now, I want to make sure we can cover them. Anderson Bus Service in Frazee is willing to run shuttle service for the Fiero people on the event weekend. If you are flying into Fargo, please let us know your schedule, and we can notify Ted at Anderson Bus Service so that a vehicle can be there to pick you up. If we can consolidate people coming into Fargo into a single trip, it would work better. Most of their heavy stuff is out at those times, but they have vans and mini-vans. Grab the photos I posted above. A past classmate of mine and her mother are going to the Holiday Inn in Detroit Lakes today to see if they will give some discounts on rooms! The whole community is watching us on here! Pretty amazing how everyone is coming together! Thanks guys it just keeps getting better! Hi FRAZEE!!! Welcome to the world's greatest car forum! I have never met Tyler, but I feel that I know him based on everything I have read, the people I have talked to, and the response I see. I have no doubt in my mind that what we have planned is a worthy cause, and I know that it has helped pull a random group of anonymous strangers both on and off the internet into a great big family with a beacon at it's center. Thank you all for the kind words and the support as we prepare to do this, and to Hulki for getting this started. The order for hats has climbed to 15 more. Ten of which are a request from Tylers family.. As it stands, I have spent more than I could afford on the first 20 hats, and I cannot afford to pay for the rest. A teacher from Tylers school contacted me and offered up some money for more hats, but still about $50 short. Can anybody help? I would buy hats for EVERYONE if I could afford it but it's just not possible. I will send part of the donation out to help you. If hat orders come in, please toss that back into the donation pot as soon as you can. 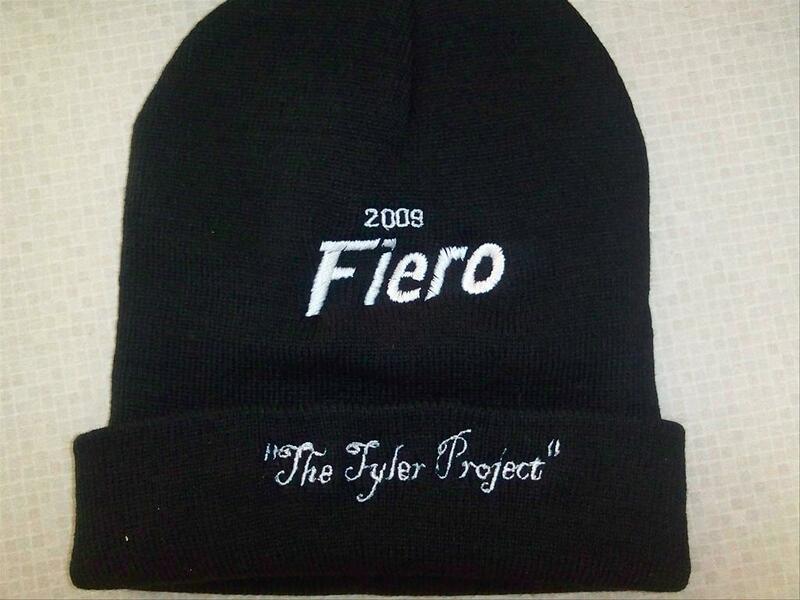 Fieroguy123 PM me your Paypal address and I will donate $50.00 towards the Hats. I myself would like 1 as well. I will make the Payment when I get home later tonight.